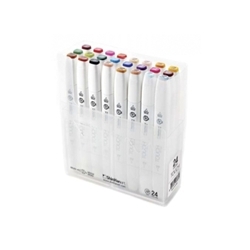 Shinhan Touch Brush Marker Set - This marker sets include the double ended Touch Brush Markers. The Shinhan art markers and designed to give flexibility. These markers feature two different nibs, one is a broad or wedge nib and the other end features a fine tip nib.